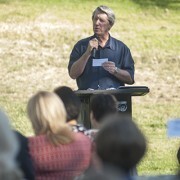 FRESNO – The Fresno Chaffee Zoo Dining Garden was the site of the Economic Development Corporation serving Fresno County’s BEAR Breakfast, where healthcare was the topic of discussion. Presenters included Dr. David Hawkins, provost and dean of pharmacy with California Health Sciences University, as well as Lynne Ashbeck, regional vice president of the Hospital Council of Northern & Central California. Hawkins discussed how the Central Valley could meet the increasing demand for primary care professionals in our region. Ashbeck shared the significant economic impact of hospitals in Fresno and Madera Counties. 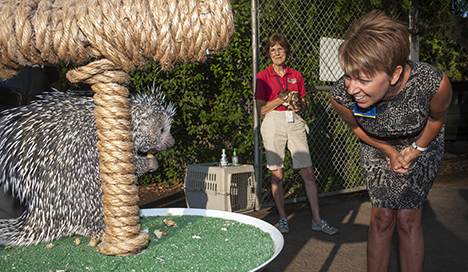 Lee Ann Eager, president and CEO of the Economic Development Corporation serving Fresno County, took time to check out a porcupine before the EDC’s BEAR Breakfast at Fresno Chaffee Zoo. “Healthcare is one of those industries that sort of gets overlooked, and people don’t realize the economic impact of the healthcare industry to our Valley,” said Lee Ann Eager, president and CEO of the Economic Development Corporation serving Fresno County. Eager shared that 45,000 are employed in healthcare in our region, and generates $6 billion yearly for Fresno and Madera counties. It is one of the biggest employers in the area, next to education. Large amounts of money locally have gone to the industry; for instance, hundreds of millions of dollars in construction costs have been used to expand Clovis Community Medical Center. After the presentations, attendees had a chance to visit a booth by Monster City Studios, which had one of its creations, a life-size elephant head, on display, as well as take a look at the zoo’s popular exhibits.